Easily migrate to another network provider. No more expensive roaming surcharges. Get more money for selling your cell phone. Unlocking guaranteed or we'll refund your money. How to unlock my BenQ-Siemens phone with doctorSIM? 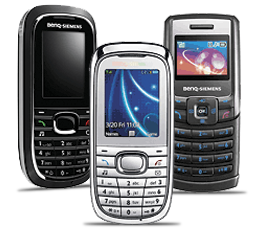 Unlocking any BenQ-Siemens cell phone can be done in 3 steps. First, complete the online form with the details of your phone. Second, select a safe payment method to submit your request. Finally, insert the unlock code sent to your inbox to finalize the process. What services do doctorSIM provide? doctorSIM provides phone unlocking services which allow users to use their cell phone on any compatible GSM network in the world. Freedom to choose network carriers has multiple benefits primarily saving money in the long run. Complementing these unlocking services are IMEI phone checks, top-up services for networks located in over 200 countries, comparison tools for managing and calculating savings on monthly phone bills and repairs for all phone manufacturers. How much does it cost to unlock a BenQ-Siemens cell phone? Our prices vary depending on the country and network carrier. The final price to unlock your BenQ-Siemens will be displayed on the screen once you've completed the online request form. We review our prices every day to make sure we offer value for money and pride ourselves on having the best prices in the industry. Can I use my BenQ-Siemens on every network in the world once unlocked? Almost, but not all. You will be able to use your BenQ-Siemens on any compatible GSM network but not on carriers supporting CDMA technology such as Verizon, Sprint or Virgin Mobile in the United States. Fortunately, most of the world uses GSM. Nonetheless, before unlocking your cell phone, we recommend checking with your new carrier that your BenQ-Siemens will work on their network. Do I need to know the model of my Benq-Siemens phone? No, whether you want to unlock an A38 or an SL91 you do not have to indicate the model as our unlocking services are valid for all BenQ-Siemens models. The unlock code you receive will depend on the IMEI number (unique identifier), so make sure you send us the correct IMEI by typing *#06# on the cell phone's dial screen. Do not trust the IMEI on the packaging or receipt as they may not coincide with the phone. How long will it take to receive my BenQ-Siemens unlock code? Our BenQ-Siemens unlocking services are extremely fast and under normal circumstances, you will receive your unlock code within a few business days. The guaranteed and average delivery times will be displayed on the screen once you have selected the original carrier of your cell phone and the corresponding unlocking service. Do your unlocking services work on blacklisted cell phones? Yes, we can network or SIM unlock blacklisted cell phones, however, they will not work properly on any network in the country of origin of the original carrier while reported. Reports are additional security restrictions imposed by the networks due to theft, loss or non-payment which cannot be eliminated with our unlocking services. You will need to contact your network carrier for assistance removing your phone from the blacklist. Will you refund my money if your services fail to unlock my BenQ-Siemens phone? Yes, you will receive a full refund if we cannot unlock your cell phone for any reason under our responsibility. However, as the unlocking process is fully automated we cannot return your money if any of the information provided on your cell phone is incorrect. You have a ten-minute grace period after you hit the submit button to modify or cancel your request. We are a professional, registered business processing thousands of unlockings a day. Legal and recommended by BenQ-Siemens. Unlocking services available for all models. Conveniently order your unlock code online without leaving home. Our loyalty program rewards you with credits to redeem for future unlockings. Unlock your BenQ-Siemens using our Mobile App on Google Play. Over 30 secure payment methods available worldwide. We use the safest, most widely deployed security protocol SSL. Great customer support via e-mail and chat.